Ahh, to be able to live and work in a lush green environment every day! Better yet, to be able to enjoy the many benefits of a green environment right in your own living room or board room! Well the reality is closer than you may imagine! Bringing the Outdoors In is something that can be quite attainable with just a few simple changes to your living or office spaces all the while improving the air quality of your space and making it aesthetically pleasing! Plants are known to have air-purifying qualities, absorbing CO2 and releasing oxygen but also filter harmful chemicals such as formaldehyde, benzene and trichloroethylene. A NASA study in the late Eighties, looking at ways to clean air in space stations, found that one plant was needed for every 100 sq ft for optimal purifying power. Plants also offer a calming effect. Studies have even shown that simply seeing green lowers stress levels and increases alertness. 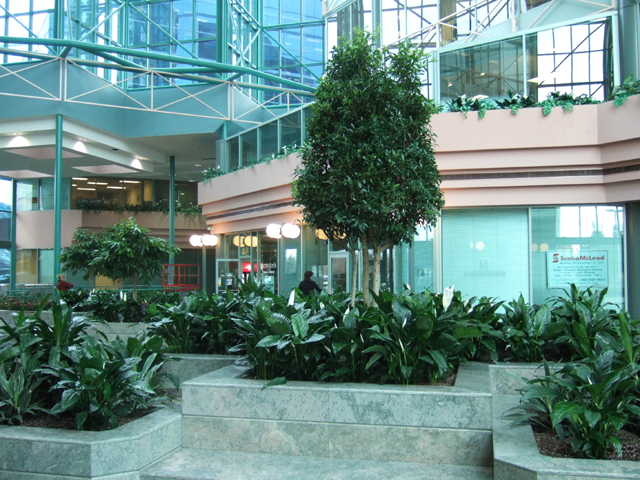 Lush and vibrant plants promote a healthy happy and productive environment and can play a significant part in projecting your company’s image. Modern, energy-efficient buildings may save on energy costs, but the lack of air circulation allows the build-up of potentially harmful gases such as formaldehyde, benzene and trichloroethylene (TCE). These gases come from such seemingly innocent sources as furniture, carpeting, household cleaning agents and office equipment such as photocopiers, and printers. The build-up of these gases often results in: Itchy Eyes Drowsiness Headaches Lethargy So, put plants and flowers everywhere! By adding some hanging plants, free standing containers, and flowering planters, you are well on your way to cleaning the air and cleaning your mind! 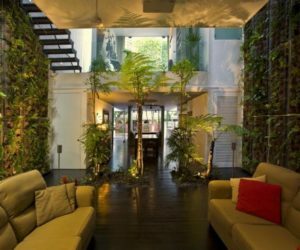 Living walls are another option and are being used more and more in homes and offices. They add colour and visual interest, and can soften otherwise drab areas. There is no end to the design factor and the health benefits are enormous! Of course other materials such as indoor ponds, using natural building materials, having an abundance of large windows to let the natural light in are all simple ways to help with bringing the Outdoors Inside. Try some today and breathe easier today!